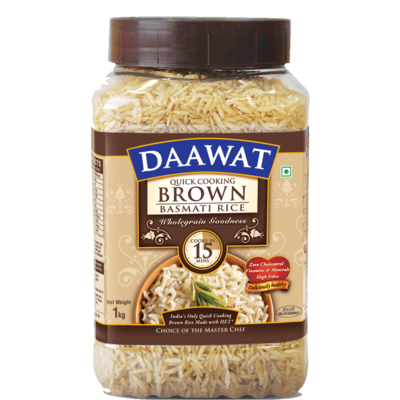 Dawaat Basmati Quick Cooking Brown Rice is a fiber-enriched low-fat healthier option than normal rice. This food grain is quite nutritious and can be consumed by people of all age groups. Basmati rice is normally cultivated at the foothills of the Himalayas; the soil and climate of the region contributes to the texture, taste and amazing aroma of the rice. Dawaat Basmati Quick Cooking Brown Rice is a fiber-enriched low-fat healthier option than normal rice. This food grain is quite nutritious and can be consumed by people of all age groups. Basmati rice is normally cultivated at the foothills of the Himalayas; the soil and climate of the region contributes to the texture, taste and amazing aroma of the rice.